Local authority leaders have called for a greater share of the soft drinks levy to go towards the public health budgets of councils. The Government has launched a series of e-learning tools to help boost health and care professionals’ knowledge of the biggest issues in public health. Local authorities will be among the bodies involved in a multi-agency initiative against knife crime launched by home secretary Sajid Javid. Spending too much time sitting around is linked to about 70,000 deaths a year in the UK, according to public health experts. Public Health England says the number of adults starting treatment for crack addiction in the last three years has gone up by 19%. New cases of TB in England have fallen to the lowest levels since records began in 1960, new data reveals. The Government today announced that £6m of capital funding will be made available to help councils increase access to alcohol treatments. Action must be taken to create communities that enable older people to stay active, campaigners have urged. Trials of the anti-HIV treatment PrEP are set to expand after local authorities agreed to commission extra places. Only a small proportion of young people are regularly using e-cigarettes, according to the findings of a new report. Youth in the UK are being ‘let down’ when it comes to treating long-term illnesses such as asthma, according to an independent health think tank. Nearly nine out of ten child health experts are warning air pollution is already having a negative impact on children's health in their region. Council chiefs have welcomed Whitehall’s announcement that it is committed to reaching zero HIV transmissions by 2030, but they urged the Government to reverse public health cuts ‘as a matter of urgency’. Practical plans to tackle childhood obesity are to be developed by 13 councils after they received funding from the government’s Trailblazer programme. Thousands of life-threatening illnesses could be prevented if major cities increased cycling rates to those seen in London since the turn of the millennium. Local authority leaders have said they are ‘pleased’ with NHS England’s decision to expand the trial of a drug that could ‘significantly’ reduce levels of HIV. Council leaders have called for immediate action to tackle sugar consumption after new figures showed more than 45,000 teenagers and children had teeth extracted in hospital last year. Cash collected from the 'sugar tax' has already helped in the fight against childhood obesity, according to the Government. Councils have been urged to help drive down smoking rates after research revealed smoking is twice as common in social housing than in other tenures. Universal Credit (UC) is bad for health and wellbeing, academics have found in a new study commissioned by Gateshead MBC. Nearly one in 10 deprived areas in England and Wales do not have easy access to healthy, affordable food products, new study shows. More than a million people have stopped smoking in England since 2014, new figures have revealed. A report looking at the state of the nation’s health has revealed that the rich live nearly 20 more years than the poor on average. A deal between Birmingham City Council and a multi-national tobacco company to promote e-cigarettes has been branded 'a disgrace' by a government minister. Around 3.7 million children are living in households unable to afford a healthy diet, according to a new study by a think tank. HIV diagnoses in the UK have fallen for the second year in a row, public health body reveals. The mayor of Greater Manchester, Andy Burnham, has unveiled a plan to end all new cases of HIV in the city region within 25 years. Lancashire County Council has agreed to re-evaluate its tendering process for public health services after a court ordered the council to set aside its agreement with Virgin Care. Deaths from hepatitis C-related end-stage liver disease have fallen by 11% in 2017 compared to the previous year. Breastfeeding campaigners have warned mothers are facing a postcode lottery after research found 44% of councils have reduced or closed down their local support services. Local authorities have been told to prepare their areas for the impact of climate change as experts predict heat-related deaths will treble by 2050. New research from the Association of Play Industries has revealed the scale of decline in playgrounds across England. LGN finds out more. 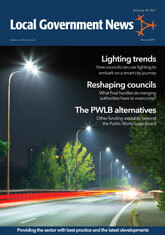 The Institution of Lighting Professionals explains why LED street lighting does not pose a risk to public health when specified and installed correctly. The most deprived areas in England have five times more fast food outlets than more affluent communities, new figures have revealed. Supermarkets will be prevented from displaying unhealthy foods and sweets at their checkouts in a crackdown being considered by health secretary Jeremy Hunt. Lancashire CC’s award of a contract to Virgin Care has been blocked by a legal challenge. Healthcare professionals in GP surgeries will soon be able to offer advice on how patients can reduce their dementia risk, Whitehall says. National health policy needs to recognise the ‘cost-effective benefits’ of initiatives designed to tackle loneliness, local government leaders say. Pollution from cars and vans costs £6bn per year in ‘health damages’, new research has revealed. Cuts to public health budgets have made tackling sexually transmitted infections a ‘significant challenge’, warn local authority leaders. Council chiefs have warned against buying ‘suspiciously cheap’ skin creams because of a possible cancer risk. A national obesity strategy would help strengthen existing services and replicate best practice across the country, according to a new report. Nurses have warned cuts to public health budgets are forcing them to turn people away from sexual health clinics due to the resulting staff shortages. Barnsley Council is developing a food plan aimed at creating a ‘sugar-free town’ as part of the struggle against obesity. Nine out of 10 councils have cut spending on public health services in response to Government reductions to their budgets. Whitehall should reverse its cuts to local authority public health grants in order to tackle the increase in drug-related deaths, doctors say. A child in England has a tooth removed in hospital every 10 minutes due to preventable tooth decay, public health body says. Local authority chiefs have repeated their calls for the ‘traffic light’ food labelling system to become a legal requirement post-Brexit as health campaigners warn of the high salt content of ready meals. The Government is investing £300m from its industrial strategy challenge fund to help prepare for 'the challenge of an ageing society'. Andy Howell explains how active healthier lifestyles are being driven by urban renewal in Slough. The number of people living with diabetes in the UK has more than doubled over the last 20 years, new research has revealed today. One in three patients suffering from dementia do not get the NHS follow up support they’re supposed to because of a lack of care plan, older persons charity finds. Traffic light labelling on food and drink should become mandatory after Brexit in order to help fight obesity, council chiefs say. Seven out of ten newly recorded cases of FGM are women aged 35 or younger, new analysis has revealed today. Public health officials in Liverpool are abandoning the use of alcohol units in their struggle against heavy drinking and are instead now talking about calories. Councils have called for a reversal of public health cuts after research highlighted the danger of people smoking just one cigarette a day. Funding to help problem gamblers is three times less than funding to treat alcohol or drug abuse, a think tank has highlighted. A cross-party group of MPs have called on the Government to tackle malnutrition in the elderly to save the NHS and social care over £15bn a year. Local authorities spent £4m on public health funerals in 2015/16 - an increase of 36% over the past five years - new research has revealed. Local authorities call for action to tackle ‘excessive consumption’ of sugary food and drink as new figures reveal there are 170 operations a day to remove rotten teeth in children. Cuts in public health grants have led to a ‘dramatic’ change in local services aimed at helping people quit smoking, according to anti-smoking campaigners. Housing associations and developers are being invited to join a national network to help put healthy living at the heart of future home building. A cut to councils’ public health grants has been criticised by the Local Government Association (LGA) for being ‘short-sighted and extremely counter-productive’. Health visitors have called on the Government to reverse spending cuts which it says are having an 'alarming' impact on children and babies. Nearly two thirds of people with diabetes experience emotional or mental health problems because of their condition, according to new research. The latest sales figures show that Public Health England’s new harm reduction approach to decreasing smoking rates across the UK has not only been widely accepted, but capitalised upon this Stoptober. The Coca-Cola truck should be banned from Liverpool this Christmas as the city is in the grips of an ‘obesity crisis’, the Liberal Democrat leader has warned. Plans to introduce a minimum price for alcohol have been unveiled in Wales to help crack down on excessive drinking. Almost one in ten children starting school are dangerously overweight, according to the latest figures from Public Health England - and the number is on the rise. The number of older people that are homeless has risen by 130% in the past eight years, council leaders have warned today. An organisation dedicated to tackling underage drinking is set to double the number of its local groups around the country. Those who wish to quit smoking are preparing for a month without tobacco as new figures reveal quitting success rates are at their highest for ‘at least a decade’. Young people should be educated about the risks of HIV to minimise their chances of catching the illness, according to HIV Scotland. A three-year plan to help sustainability and transformation partnerships (STPs) reduce the number of heart attacks and strokes has been unveiled today. Council leaders have called for an overhaul of mental health services to help reduce the number of registered suicides. Health services need an emergency cash injection of up to £350m this winter, NHS leaders have warned. The Government has invested £5m into a new obesity policy research unit to look at the causes of childhood obesity. Forward thinking councils are being urged to apply for the Design in the Public Sector programme to help tackle public health challenges. The NHS is to make a drug, which has been shown to dramatically reduce the risk of HIV infection and was the subject of a lengthy legal battle, available from next month. Experts have urged the government reverse pubic health budget cuts as official figures show the number of deaths related to drug poisoning are continuing to rise. The Local Government Association (LGA) has warned sexual health services are at a ‘tipping point’ as visits have soared by up a quarter in the past five years. Closing roads to allow children to play in the street can help make them five times more active, a new report has revealed. The number of children getting enough physical activity drops by 40%, health body warns. Councils have been forced to cut spending on public health services by 5% in the past four years, according to new analysis by The King’s Fund. Local authorities have been urged to control and manage the spread of Giant Hogweed, which can cause severe blistering to the skin of people who come into contact with it. Parks are an asset to communities and should not be viewed as a burden by local authorities, charity says as it launches new research findings. The number of smokers in Britain has fallen by 1.9 million since the smoking ban was introduced ten years ago, new figures have revealed. The percentage of young adults who smoke in England has fallen by over 5% in the last five years, new figures show.